Carmen Winters has already lost so much. Now, she is beyond terrified as she stands to lose the one thing that gave her hope for a better future. She knows that she can pull through her physical and psychological difficulties, if only someone will stand by her. But with her father and sister occupied with their own struggles in another state, she has no family she can lean on. Her only options are to turn to Brad, a ruthless lawyer mainly concerned with dollar signs, or Owen, a kind doctor with a jealous and spiteful long-term girlfriend. With or without help from the frustrating men in her life, Carmen will have to find the strength inside herself to carry on. She must make one final journey to say goodbye to her husband once and for all, and lay the past to rest forever. 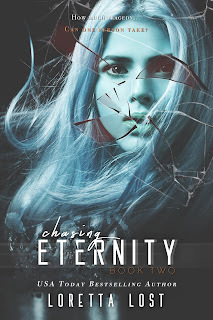 The second book in the End of Eternity series. how much longer.... oh my this is a great series!!! i love the first book, i really wish i could by the others so i would know what happen. it's a great story. I have read the first book in the series End of Eternity. Desperately want to read 2nd part. Can you please mail me the book on mak007.mayank@gmail.com? Where are we to write our reviews to get the next book in the series? I am also querying where to post our review. I loved this book especially but it has left us hanging on a cliff. Really want to review this so I am able to reado the next installment as soon as possible, so I don't get confused and do spoiler alerts by mistake. I received the Eternity Book 2 in lieu of an honest and independent review on the book. Having read most of the Clarity books, regarding Helen, Carmen's younger sister, I was thrilled to see another series about Carmen and what happens after her husband had committed suicide. The book had a good pace and I thoroughly enjoyed the plots of the script. I do not like to give away details about the script but this book continues to uncover so many twists and turns. Right at the end of End of Eternity 2 was an amazing clift hanger, that I cannot wait to read the next book in the series. Loretta Lost is a fabulous author and these books are so good. I wish the best for the future of becoming a star author with her books being widely read. What a lovely novel to read. It has captivated me from page 1. I desperately need to read book 3 and 4. I would recommend this book to any and every reader.